NOTE! The memorial to Nig has been upgraded. See the new sign and history in the video below. If one were asked to name the most notable figure associated with the construction of Hoover Dam, without hesitation, the name Frank Crowe, superintendent of construction, would come to mind. However, there is another memorable character that would be a close second, Nig, the dog of the dam. For a mascot who so endeared himself to the dam workers, the details of Nig's origin remain somewhat vague. The few facts having to be gleaned from bits and pieces of some of the dam worker's recollections. Be that as it may, it is reported that Nig was born under the Six companies No. 4 dormitory (another version states that it was the police shack) in 1932. The exact date is not known. A description of the mother and the fate of Nig's litter mates is likewise unknown. Apparently Nig's physical appearance was that of a Labrador mix with a coarse, stiff hair pattern, over sized paws, a white blaze on his chest , and a short stumpy tail. Nig attracted the attention of the workers and was adopted by them. He was partial to none, and became known as "nobody's dog and everybody's dog." He had free run of Boulder City and the dam site. After being taken to the dam one day by one of the workers, Nig soon learned to join the crews whenever he desired by hopping aboard one of the transports carrying the men to the dam. There he would stay as long as he pleased, and would return to Boulder City when the shift was over. So the story goes, one day he was at the dam and wanted to return to the city earlier than usual. He recognized the big Buick driven by Frank Crowe, let out a bark, and was last seen sitting in the passenger seat as Crowe drove his sedan back to town. Nig inspected dam operations each day. As the dam rose higher, he would hop on one of the skips (a small wooden platform suspended from the cable system that delivered men and equipment down into the canyon). When he wanted to board a skip, he would give his characteristic bark, and the operators always stopped for him. He would then hop aboard and bark again at the level of the dam where he wanted to disembark. "I love candy, but it makes me sick. it also is bad for my coar. Please don't feed me any more. Your friend, the Hoover Dam Mascot "
The mess hall packed Nig's lunch each day in a special container and the dog soon learned to carry it in his mouth when he boarded the transport truck to go to the dam. At the construction site, he placed the sack alongside the worker's lunch pails and would not eat it until the whistle blew for his crew to break for a meal. The workers paid for Nig's meals. The contributions were so plentiful that a bank account was established for Nig. The extra funds were also used to pay for his other needs, including a silver collar. To show just how important Nig was to the dam workers, one evening Nig was dozing on one of the dormitory walkways when a worker ordered him to move. when Nig continued to sleep, the worker kicked him. Other workers, seeing this act of violence towards their friend, quickly pounced on the kicker and proceeded to deliver frontier justice. One of the city rangers was called in to save the man who was being pummeled by the workers. When the ranger learned what the man had done, he promptly escorted him to the edge of town and told him never to come back. After the dam was completed, Nig continued to make his rounds at the dam, and would insist that the tourists followed the rules. On February 21, 1941, Nig decided to take a nap in a spot of shade under a truck. The driver failed to notice the sleeping dog when he returned to the vehicle and drove off. By the time that the driver felt the crunching of bones and Nig's banshee wail of pain, it was too late. Nig died instantly. News of the fatal accident was phoned to town and it was said to have been the saddest afternoon Boulder City has ever experienced. Many of the workers wept openly as they prepared a place for Nig's eternal rest at the edge of the cliff overlooking the dam. A concrete slab with the inscription "NIG" was placed over the grave site. Nig could thus continue his oversight of the daily activities at the dam. But that was not to be the last to be heard of Nig. Many years later, a visitor to the dam felt that the inscription on the grave stone "NIG" was racist, and he campaigned to have the inscription removed. the issue hit the national press and finally the Bureau of Reclamation chiefs ordered that the name be removed. Later, the locals insisted on some kind of recognition for Nig and a plaque was placed on the canyon wall above the plain concrete slab. It identifies Nig as the mascot of the dam builders, but does not mention his name. 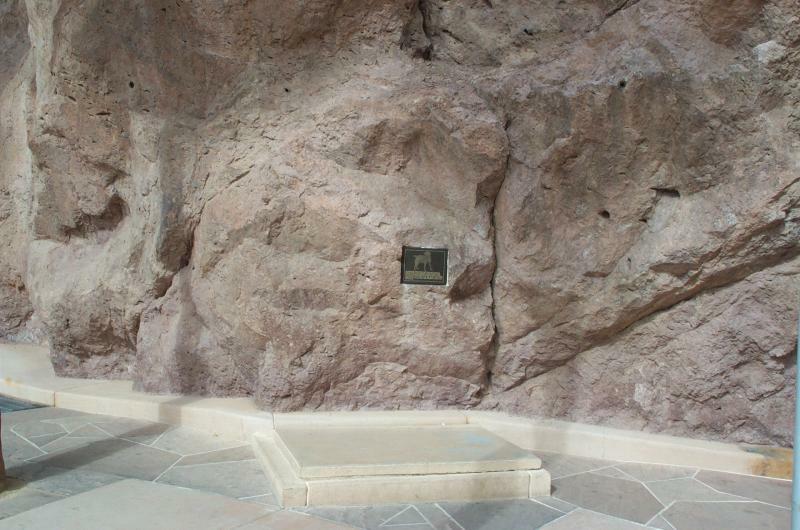 Today, Nig's grave site and plaque can be found just across the road from the escalator leading to the new tour center. It is located in a shallow niche in the canyon wall and is easily missed by the tourists awestruck by the magnificence of the dam. Whenever I visit the dam, I make a point of standing there and observing the grave and plaque. The tourists wonder what I am looking at and then stop and discover the resting place for themselves. They then move on to the parking structure unaware of the importance of their discovery.